Not knowing much about the Brazilian contemporary dance company, Grupo Corpo, I went into the theater on Tuesday night with my eyes and mind open. I certainly got an eye-full and I came away with a lot to think about. The 27-year-old dance troupe - which incorporates a mixture of dance cultures including Latin, African, ballet, and jazz - kicked off the Brooklyn Academy of Music's (BAM) 20th Next Wave Festival with a high-energy, innovative, organic performance. What was most exciting about the performance was that it seemed to be an organism of contradictions that functioned splendidly as a cohesive whole. For example, the choreography was primitive yet avant-garde, the dancers were synchronized yet independent, and the overall effect was exhilarating yet exhausting. 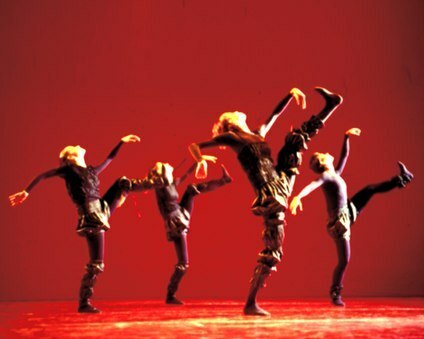 The push/pull, or yin/yang was apparent in the way the dancers' bodies worked with and against each other, the way the set design and lighting contrasted and complimented the choreography, and the way the music was dissonant and integral to the theme. It left me wanting to know more yet with a new understanding. 21: Choreographed by Rodrigo Pederneiras, music by Marco Antonio Guimaraes, set design by Fernando Velloso, lighting design by Paulo Pederneiras, costume design by Freusa Zechmeister. While all of the dancers started off the piece with their feet firmly planted on the ground and their bodies swaying in circles - in unison, the dancers quickly burst into their own patterns of movements (sometimes jerky, sometimes mellifluous). Various combinations of dancers performed various movements at different times. Some dancers floated onto the stage as though walking underwater, while other dancers exploded onto the stage with startling force. Similarly, there were abrupt changes in music, tempo, costume, and lighting throughout. The ebb and flow of bodies, light and sound hardly paused for a breather during the entire 45 minutes - and climaxed with amazing displays of strength and coordination by pairs of dancers that one might expect to see only at the circus. O Corpo: Choreographed by Rodrigo Pederneiras, music by Arnaldo Antunes, set and lighting design by Paulo Pederneiras, costume design by Freusa Zechmeister and Fernando Velloso. 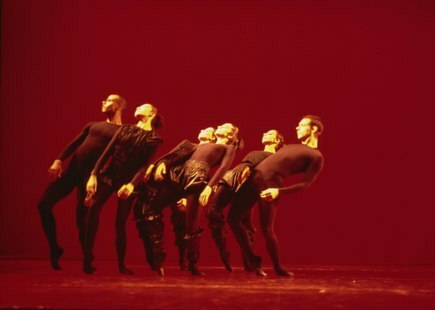 The word, "corpo," when referring to the troupe's name, could mean a human body, a body of work, or a corps de ballet. "O Corpo" - the title of this piece - however, invoked simply a living, breathing, heaving, pulsating body. The piece, set against a wall of blinking red lights, began with a tech/jazz beat that made me want to get up out of my seat and rock with the dancers. But I didn't have much of a chance since the fast-paced punk vibe eventually transitioned into slower movements. Toward the middle of the piece, a square block of white light followed the honeyed movements of several dancers across the stage. The final movements, though not quite as eye-catching as the final movements of "21" were fast and vibrant, and had the audience cheering and standing. Just as in the first piece, the most impressive aspects of this second piece were the sheer acrobatics, the contortions, and displays of strength by the dancers. In their own turns, pairs of dancers used their bodies to enfold and support each other with such seeming ease that they appeared to be one. Again, the contradiction: Each entity (be it two dancers, a group of dancers, or the whole company) dancing to a different drummer but at the same time working as an integral part of a single body. The next wave indeed, a tidal wave in fact.